My festival mood board sure came in handy as I went to not one but two festivals this year. 4Music offered a pair of tickets to Fusion Festival and I grabbed my festival friend for a day of music and dancing. Festivals are such a mood-booster as there's nothing like sharing live music with thousands of others, plus a chance to hang out with friends all day and wear a cute outfit of flower crowns and glitter tattoos that would be wholly inappropriate for any average Saturday. I said in a previous post how it's essential to have dates in the calendar to look forward to and Fusion Fest. falls on the Bank Holiday - perfect timing! Cofton Park is only 15 minutes on the train from Birmingham city centre and is minus all of the camping horrors, as I found the weekend before in the soggiest tent that ever existed. We cruised into the fest with iPhone weather promising clear skies each hour, and there's something so satisfying to be outdoors all day in the sunshine. We were delighted to head straight to the VIP section with a huge canopy bar area full of comfy soft seats and high bar tables to perch at, plus the heavenly clean toilets. I cannot look at another port-a-loo again! I've never done VIP at a festival apart from when I scored a backstage pass, and it's so nice to sit on something comfortable and have no queues! We chose a Vimto Sunrise from the Vimto bar that was totally delicious - I love pineapple! - and I'll definitely be making that again. Determined to sample all of the music on offer, as I love seeing acts and artists that you are only just familiar with, we sat back to enjoy Ella Henderson at the main stage. Fusion Fest is super youthful and cool, with plenty of teens and families alike enjoying the ice creams and laid-back vibes. The food stalls are a notch up from any festival grub I've seen before, with a few quirky vans like the No Dog Quorn offering below! I am going to have a bash at a few of these myself for a quick lunch. Sigma was up next and had everyone jumping, and we soon retreated back to the VIP area for a a break in the comfy lounge and a sample of a Vimhito, with extra bon bons! Some guys asked if they could sit at our table and when I asked about their press lanyards, it turned out the were Facebook millionaires (in terms of likes, not pounds!) and were going on stage with The Vamps the next day. Complete with manager and body guard (really) we joked around that they must be members of The Vamps as we'd never heard of them (lolz) and recommended a few places to go out later. As someone who has the full time job but blogs on the side for love rather than a career aim, it was interesting to meet people doing it as their main income. You can see the guys in my vlog below, and they get mega points for thinking we were in their main 16-24 age bracket of fans! ... and Rudimental, who I have seen a few times before and love the live band set-up and how they bring on a host of different singers. Such feel-good music! I had a fantastic weekend with my best beauty buddy Georgie and if you have ever considered a city break in Manchester, this is the post for you! We were planning a sunny get-away but time and prices ran away with us, and it was better to plan a local trip in a UK city and shop 'til we dropped. And that's exactly what we did, deciding on Manchester! This is my student city (along with Boras, Sweden - do you remember when I lived there!?) and I love everything about Manchester and the North in general, from the style and spirit to the music/food/shopping scenes. Georgie and I met on the train despite myself managing to book the one arriving an hour before, and we gossiped none stop until Manchester Picadilly. We booked the Premiere Inn at the Printworks, even though its a good 5 minute stroll from there, as it was also right next door to the Arndale shopping centre. If you're there for the shopping, it's best to spend a day in the city and a full day at the Trafford Centre. We dumped our things and headed off for lunch in the Northern Quarter; a menagerie of vintage stores, quirky record shops and trendy eateries. Trof was a favourite of my friends who continued to study in Manchester after I graduated and has a sweet menu with burgers, sandwiches, and apparently comes alive at night with a cocktail bar and three floors of music. It's not too pricey and we had the place to ourselves, minus a PDA couple that joined our corner as we finished. Fuelled and ready to hit the shops, I showed Georgie down Market Street and towards Selfridges. I had no idea their food floor was no more and we went down to the beauty hall to hit it hard instead. We made a pact to be totally on the ball with gaining any samples we could then try out that evening, and Georgie was a master! We were in the market for oils and eye creams, and as a testemony to Northern spirit, every assistant was so friendly and more than happy to offer a sample or two, or ten in Aesop's case! We even saw some dudes rack up a £900 bill at the Tom Ford counter and gossiped about their footballer status to the Lancome ladies. How beautiful is this Eyes to Mesmerise shade by Charlotte Tilbury?! We carried on around the shops, Georgie was enlightened by the bargains of Bodycare, and we splurged some vouchers I won at work on a takeaway Pizza Hut, complete with salad bar and our drink of choice - sparkling water! In matching Ariel pyjamas, it was the ultimate sleepover. A few movies and some beauty sleep later, we awoke and immediately inspected the results of all of the skin care we had sampled the night before, before applying loads of makeup and heading towards Home Sweet Home for breakfast, as kindly recommended on Twitter by Sarah of Sequin This. Sadly there was a 45 minute wait for brunch so we took a look at the many cafes in the nearby streets and stumbled across Superstore. The wooden and charcoal metal interior was industrial but rather simplistic and relaxed too, and we indulged in matching berry pancakes with honeycomb butter - not too plentiful but absolutely delicious! And then we hopped on the Magic bus and towards the Trafford Centre! This is truly an all-day event and the centre almost feels like you're on a cruise ship with it's Greek decor and fountains. 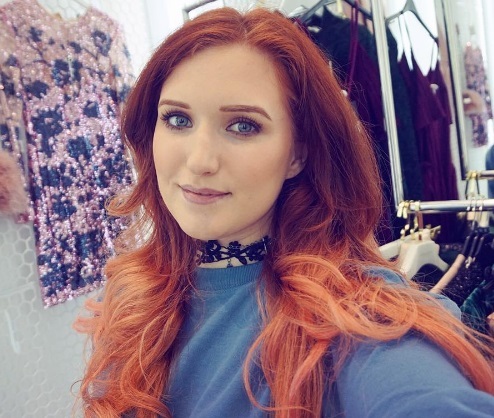 The first stop I wanted to make was the new Missguided concession in Selfridges! I'm the world's biggest Missguided fan and order so much from there, so it's a real novelty to check out the latest range in person. I hope the concession travels as far as the Birmingham Selfridges too! I didn't actually buy or try on anything at the concession though because I'd already seen the collection on their website and would have ordered anything I liked before! We were however entranced by the Muji storage collection, and I funnily enough discovered there has been a Muji store on New Street in Birmingham for about ten years and I never even noticed it! I'm currently discarding my things (yes I am reading this book) and once I've reordered my room, I really am keen to jump on the perspex makeup drawer bandwagon. We wandered around the beauty hall of course and I purchased the MAC LE Fix Plus in Lavender as it was one of the few flavours left but was not as heavy as I assumed it would be. Samples whiz Georgie even bagged some Creme de la Mer samples loving wrapped in tissue! Selfridges didn't have Gucci Bamboo in stock yet but a random cheapie perfume place did! This is SO on my Christmas list as I collect Gucci fragrances; I never find them sickly or sweet. A trip around Hamley's, a feast at T.G.I. Fridays with my extra winning vouchers and one Michael Bublé impersonator later, it was getting late and we whizzed back to the city centre to top up our makeup and hit the Northern Quarter! I also like Deansgate, but there are so many bars in NQ to explore and some are open into the wee hours. We indulged in cocktails and '90s r'n'b in Walrus and went onto Black Dog, an old favourite from my Uni days. An afternoon tea was the perfect way to treat any slightly heavy heads from the evening before, and Georgie had kindly booked us into 47 King Street West as my birthday present! The experience was absolutely delicious and the area is perfect for people watching so I recommend requesting a table by the window! I love cakes, pastries and sweet treats so this was such a treat and made for the perfect Sunday afternoon before saying farewell for now and boarding our train! Thank you to Georgie for a fabulous weekend! I'll definitely be visiting Manchester again - it's one of the most fun-packed cities with the room to shop and indulge as you please. Don't miss my vlog of the weekend below and subscribe if you haven't!